Got a question? Something unclear? Please see our FAQ’s below for a quick answer. If this does not answer your question, please shoot us an email at team placeholderat weddinghashtagwall replacedot com and we’ll be happy to help! How does the wedding hashtag wall work? Simple, once you have ordered your personal wall, you will receive a unique url where your wall is displayed. You can visit this url from any device in any browser. Once you have it opened up on the screen, put it on full screen for everybody to enjoy. Next step is getting images on Instagram with your own hashtag. As soon as images have been posted on Instagram with your hashtag they will show up instantly in your personal wall. When is my wall available and for how long? Once you complete your order, your wall is instantly available. It stays online for a minimum of one month after your wedding date. Is there a limit on posts? No, there is no limit on the amount of posts. All images posted on Instagram (and Twitter if you like) with your hashtag will display on the wall. The pictures of course stay on Instagram, but more interestingly we provide you a link to download all your images as once. Do all my guests need Instagram? For the moment our service supports Instagram and Twitter. Twitter is included in all Deluxe Wedding Walls. What do I buy and when purchased, what happens next? Once you have completed your order, you will get a personal link where your wall is displayed. You can login using your Facebook or Instagram account and this will direct you to your personal dashboard. In the dashboard you can set your preferences (eg. hashtag, font), download your photos and moderate content for Deluxe packages. How will all pictures show on the screen? 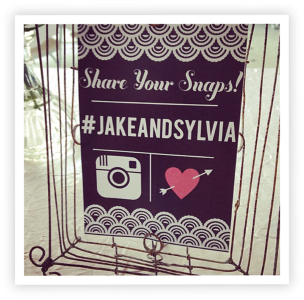 Your Wedding Hashtag Wall collects Instagram posts with a specific hashtag (it's also possible to add Twitter). The wall itself runs on a web-link. So all you need is a screen connected to a laptop/computer with internet connection. This way, you can open your show link in your browser and watch your wall! Is there a limitation on screens I can use? No, you can show your Instagram weddding wall on as many screens as you want. Does the wall show private messages from my friends? No, unfortunately this is not allowed by Instagram anymore. 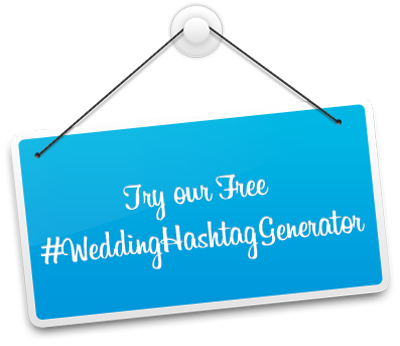 We're only able to get posts tagged with your #weddinghashtag from non-private accounts. Best to just set your account to public for the wedding day! Do you provide your service in my country? 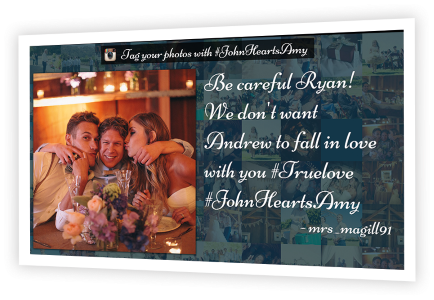 Yes, our wedding hashtag wall is available in all countries around the globe! What happens when the internet connection is lost? No worries, the wall will continue to show images that were already posted. Once the internet connection is back up, it will feed in all new images immediately. If you have any more questions? Please shoot us an email at team placeholderat weddinghashtagwall replacedot com and we are happy to help! Can I only use Instagram in my wall? Can is use more than 1 hashtag? Yes, you can. You can use an unlimited amount of hashtags, but we suggest to use a maximum of three. Just shoot as an email once you ordered and we will add your extra hashtag!